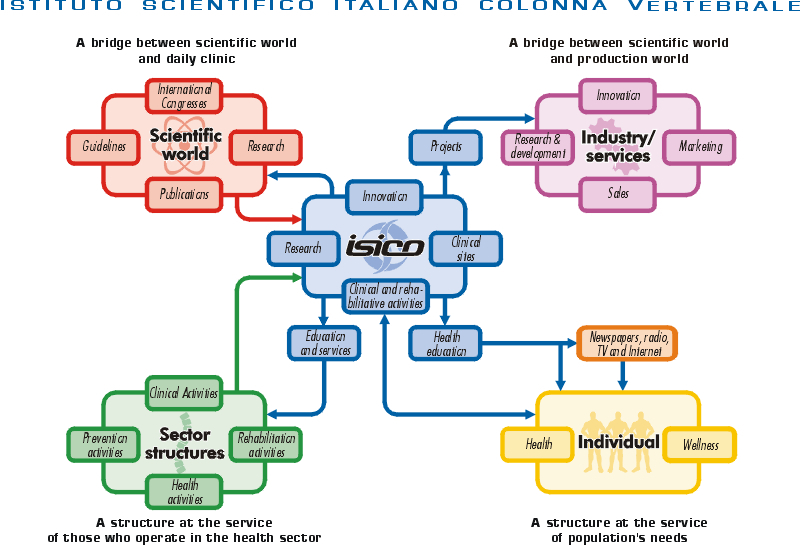 ISICO (Istituto Scientifico Italiano COlonna Vertebrale, or Italian Spine Scientific Institute), was established at the end of 2002 to promote and develop an innovative model of approach to spinal pathologies. This approach is the result of a history that began as long ago as the early 1960s, when in Vigevano (Italy) Antonio Negrini and Nevia Verzini founded the Scoliosis Centre “Centro Scoliosi Negrini” (CSN). The therapeutic activity was mainly directed at scoliosis and kyphosis treatment, making use of rehabilitative methodologies that in those days were the most popular ones in Italy. Year after year these methodologies were enriched through the exchange of information and experiences with the most qualified European scoliosis centres: France (Lyon, Paris and Berck), Switzerland (Geneva), Sweden (Goteborg and Stockholm), Belgium (Bruxelles), the Netherlands (Antwerp) and the USSR (Moscow). Particularly, the CSN began a collaborative effort in the study and research of scoliosis with the “Centre des Massues” in Lyon, France (Fig. 1), which in those days was considered one of Europe’s most prestigious centres for scoliosis treatment. Together with this French institution, in 1980-84 the CSN took part in an international research study on the efficacy of exercise in the treatment of minor scoliosis.91 This contact with French centres allowed the CSN to establish study and updating relationships with well-known researchers like Stagnara, Duval-Beaupère, Perdriolle and Mollon. The huge quantity of scientific studies on the spine, as published in the international literature throughout the 1970s and ‘80s, allowed the CSN to gather considerable data regarding scoliosis aetiology and pathogenesis. To delve further into this reality, in 1978 Antonio Negrini, together with a group of Italian specialists and physicians, promoted the foundation of GSS (the acronym for Gruppo di Studio della scoliosi e delle patologie vertebrali, or the Italian Study Group on Scoliosis and spinal pathologies - Fig. 2), which today continues its thirty-year legacy in the pursuit of professional training based on scientific evidence for Italian professionals in the field of rehabilitation and prevention. Fig. 2 –The logos of Scoliosis Centre Negrini (www.centronegrini.it) and the Italian Study Group on Scoliosis and Spinal Pathologies (www.gss.it). 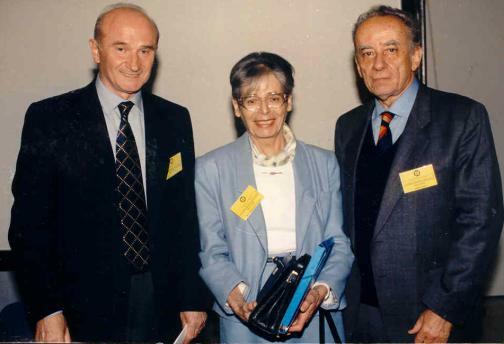 The 1985-1995 decade saw the beginning of a permanent cooperation with one of the major Italian rehabilitative structures, the “Fondazione Don Carlo Gnocchi.” This institution promoted the protocols developed by CSN in Vigevano with the medical and scientific collaboration of Dr. Sibilla, the physician in charge of the Scoliosis Unit at that institute. Paolo Sibilla (Fig. 3) was an orthopaedic spinal surgeon who had decided to dedicate his life to the conservative treatment of scoliosis in order to reduce, as much as possible, the numbers of patients undergoing surgery. He obtained much of his experience at Gaetano Pini Hospital in Milan, where he primarily attended, among the others, the orthopaedic schools (whose principles he assimilated) run by Stagnara in Lyon (EDF plaster and Lyonnaise brace);150,152 by Agostini in Padova (Risser’s plaster);80 and by Chêneau (the homonymous brace, in its first version dating back to the 1980s).23,24 Another important contribution to his professionalism came, after the initial training at the rehabilitation school in Lyon, from continuous contact with rehabilitators who were deeply involved with medical exercises for scoliosis, which he firmly believed he could personally verify based on the results, and thanks to which he could develop other therapeutic ideas.29,101,144-146 The later years of his life developed into a rehabilitative reality much like that of the “Fondazione Don Carlo Gnocchi” in Milan, which became a research institute financed by the Italian Health Ministry, with the possibility for further development of his theories. 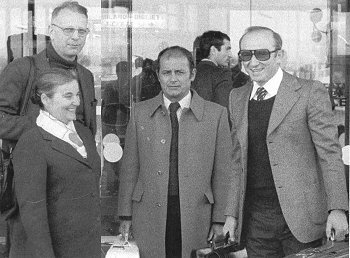 Therefore, Dr. Paolo Sibilla has been a pioneer of new and more effective orthotic solutions for scoliosis, but it was most of all his rigor and deep humanity that brought him professional success. Amid this confluence of clinic, scientific, human and professional experiences, ISICO’s founders could develop their experience regarding scoliosis. The combination of all this with organisational and managerial skills, the use of new technologies and the know-how for high-level, rigourous scientific research became a concrete reality with the foundation of ISICO. In all this is reflected the mission that ISICO has espoused as the foundation of its activities: to promote a scientific approach to the rehabilitation of spinal pathologies in Italy, proposing itself as a highly specialised institute in the field of rehabilitation for patients with spinal diseases. Accordingly, ISICO wants not only to accomplish the application of this approach within its structures but also to promote its circulation, thanks to its role as a “bridge” among the different realities in this field (Fig. 4): the structures of the territory, the world of research, the world of industry and society as a whole. Fig. 4 ISICO is born to build bridges between different worlds that sometimes have difficulties to communicate: working directly in the scientific and clinical fields, the aims of ISICO include also education, mass media communication, prevention, and research projects for industries. The foundation we wanted to give to ISICO’s work, on the basis of our history, has been clearly discernible from the beginning: to derive clinical and therapeutic choices (Evidence-Based Clinical Practice, EBCP) from scientific knowledge (Evidence-Based Medicine, EBM). In a context such as spinal rehabilitation, in which unsuitable treatments based on beliefs and opinions are very frequent, we felt the need to do something more stringent. We chose to have more certainties on which to base our approach, as well as an external reference instead of an internal, self-centred one. In that respect, science is a reference we can trust, because it is not based on the ideas (even if creative and clever) of one or more persons but on the proof of research integrated with the thoughts (expert opinions) of an entire community--the scientific community--that continues to study and grow. EBM has been defined as the “integration of the best scientific proof coming from research with clinical experience and patients’ values”141. Therefore, it is not a supine application of the scientific knowledge to our patients (this alone could be meritorious as compared with the application of one’s preconceived ideas, which is a distinguishing feature of many physiotherapeutic and therapeutic methods) Instead, it is the integration of this knowledge in one's clinical experience in order to produce a proposal that must then interact with the patient, who is no longer a mere spectator of the medical act but a participant, because he/she must be enabled to consciously choose on the basis of his or her principles and values. In that respect, EBM tells us that evidence is only the background from which medical practice derives. - Stimulating and participating in a worldwide research effort (we contributed to the creation of SOSORT, or the Society on Scoliosis Orthopaedic and Rehabilitation Treatment) so as to integrate international experiences and develop new clinical studies, but also theoretical “basic science” reports that could in the near future prove useful in clinics, such as those on classification and measurement systems. - Consideration for cosmetic appearance and style, which is innate in being Italian. However, let’s return to the basic issue: if there are so many variables concurring to build a clinical approach, does EBM really help? We think it does. We established our organisation to give EBM answers to patients, and EBM has become a daily clinical practice at our facilities. The Italian guidelines on scoliosis,106 that are rigourous and internationally innovative, and fully an EBM national project that ISICO helped to develop, for our organisation are a definite policy of clinical practice. Additionally, this means we are always ready to change our ideas in the face of new scientific evidence in the literature. We continuously investigate our results to build our daily clinical approach on objective results, not on ideas, presumptions, traditions and trends. EBM is a way of thinking that becomes a daily behaviour.